The workshop will encourage a theoretically diverse and interdisciplinary conversation on the impact of an increasingly digitally mediated public sphere has on contemporary democracy. To what extent is the digital undermining or enhancing democratic expectations? What interventions could improve the democratic character of the public sphere? 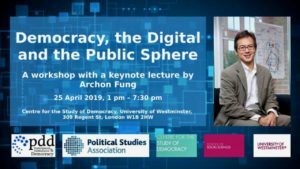 The event will be structured around two panels and a keynote lecture by Archon Fung on “Democracy, Design, and the Digital Public Sphere” (a paper he is co-authoring with Joshua Cohen). It will be hosted by Graham Smith. Archon Fung is Winthrop Laflin McCormack Professor of Citizenship and Self-Government at the Harvard Kennedy School. His research explores policies, practices, and institutional designs that deepen the quality of democratic governance, in particular, public participation, deliberation, and transparency. He co-directs the Transparency Policy Project and leads democratic governance programs of the Ash Center for Democratic Governance and Innovation at the Kennedy School. His books include Full Disclosure: The Perils and Promise of Transparency (Cambridge University Press, with Mary Graham and David Weil) and Empowered Participation: Reinventing Urban Democracy (Princeton University Press). A link for free ticket registration will be available soon. This event is a collaboration of the Centre for the Study of Democracy and the Participatory and Deliberative Democracy specialist group with friendly support of the Political Studies Association. The Centre for the Study of Democracy, based in the School of Social Sciences, has an international reputation for research excellence, with research themes in: critical international theory; democratic theory and practice; gender and sexuality; governance, complexity and resilience; post-colonial politics development and emerging powers; security, violence and justice, and social and cultural lives. class="ai1ec_event-template-default single single-ai1ec_event postid-2952 samba_theme samba_left_nav samba_left_align samba_responsive wpb-js-composer js-comp-ver-5.0 vc_responsive"